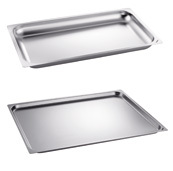 Stainless steel Gastronorm trays with a smooth rim are perfect for the presentation of food at buffets or serving stations. BLANCO Gastronorm trays are characterised by their exceptional stability. They are available in strengthened or specially annealed models. GN trays (BZG) enable appetising and attractive presentation of food and feature an extra-smooth edge for even better hygiene. Specially annealed GN trays (BZG-G) are characterised by their exceptional stability and temperature resistance, which also makes them the perfect choice for the combination steamer.